Looking for a delicious way to eat apple a day? Why not stuffed with peanut butter or cheese! Wash apples; remove core, leaving apples whole. 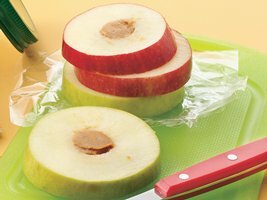 Fill center of each apple with about 2 tablespoons peanut butter, packing gently. Wrap each tightly in plastic wrap. Refrigerate until filling is set, about 30 minutes. Cut each apple crosswise into 1/2-inch-thick slices. Divide slices into 4 portions; wrap each portion tightly in plastic wrap. Refrigerate until serving time. I tried this one already bayot and it taste good.